KINGMAN – As a volunteer police officer in this northwestern Arizona city, Harley Pettit saw young people get in trouble for everything from drugs and alcohol to vandalism. In a small community with not a lot to do, he said, the last thing young people need is another way to get into trouble. He’s worried that’s exactly what medical marijuana will give them. Pettit voted against Proposition 203, and election records show that the city as a whole rejected the proposition last November by a margin of about 52 percent to 48 percent. In fact, Mohave County was one of 12 counties among 15 in Arizona where more people voted against the proposition. But now Kingman must make plans for medical marijuana, and Pettit said he has no choice but to help his city limit the consequences. In the meantime, Pettit turned to his only remaining outlet, showing up to Kingman Planning and Zoning Commission meetings and urging members to not allow a marijuana dispensary inside the city limits. Sandi Reynolds, a commissioner, said she and other members felt the same way as Pettit. But when it came down to creating zoning requirements, excluding medial marijuana dispensaries from the city just wasn’t a legal option, she said. The commissioners reluctantly voted to allow them in one type of commercial area and the city’s industrial zones. Most cities in Arizona have already approved zoning regulations in preparation for June 1, when the Department of Health Services will start accepting applications for dispensaries, said Ken Strobeck, executive director of the League of Arizona Cities and Towns. Mos communities have taken a similar route as Kingman by allowing dispensaries in industrial areas, Strobeck said, with few willing to let them operate in main business areas. “I don’t know if there is a right or wrong answer, but it is purely a matter of local control, and that is something we support in that each city should be able to make the decision that is right for them,” he said. 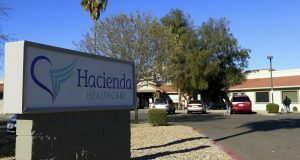 However, Strobeck said it could take at least a year before cities and the Arizona Department of Health Services begin to learn what works best. “It’s hard to know until we live with it for a while,” he said. Proposition 203 allows patients with debilitating medical conditions to obtain 2.5 ounces of marijuana, on the recommendation of their doctor, from a medical marijuana dispensary every 14 days. Patients who live more than 25 miles from a dispensary will be allowed to cultivate up to 12 marijuana plants in a closed and locked facility. The law allows municipalities to make reasonable zoning regulations for the placement of dispensaries, while the Department of Health Services is charged with creating and implementing rules for issuing ID cards for patients and allocating and licensing dispensaries. The proposition allows Arizona to have one dispensary for every 10 pharmacies in the state, which currently amounts to 124 dispensaries. In order to distribute the dispensaries evenly, the department divided the state into 124 zones, with one dispensary allowed in each zone. These zones are modifications of the state’s 126 Community Health Analysis Areas, which the department uses to track health trends like cancer rates. Will Humble, director of the Arizona Department of Health Services, said the zoning scheme was a response to law enforcement and communities asking the department to try to make sure that as little of Arizona as possible was outside of a 25-mile radius from a dispensary. “What we tried to do was strike a balance between making sure there was access to medical marijuana in rural areas, avoiding urban clustering and minimizing the grow-your-own areas in the state,” he said. On March 28, the department issued the final draft of the rules governing medical marijuana. On April 14, it started accepting applications from patients. Mohave County will have eight dispensaries, one of which will be located somewhere in one the county’s largest medical marijuana zones containing Kingman, Golden Valley and Oatman but also extending south about 60 miles to include Wikieup, Yucca, Franconia and Nothing. Reynolds said the members of Kingman’s Planning and Zoning Commission were hoping to make the city’s regulations so strict that it would be too difficult to operate a dispensary within the city limits. That was before the city attorney advised the commission that a zoning ordinance that strict would probably fall outside the proposition’s allowance for “reasonable” rules. Even if the commission could have banned dispensaries in the city, she said, members realized that having having one might be their best option. Without a dispensary within 25 miles, patients would be able to grow marijuana in their homes. “We then kind of shifted gears and thought in terms of what was the best way for us to keep it as uncomplicated as possible.” she said. Pettit, who moved to Kingman because it was an inexpensive place to retire, said that having the dispensary in the city will likely overtax the police force and cost the city more money than it can afford. If the dispensary were outside the city, it would become Mohave County’s problem. “I wouldn’t mind if it was just on the street that borders the city limits,” he said. Other kinds of businesses, such as adult bookstores, are excluded from the city, he noted. “I think we should have enough say in our destiny to say we don’t want that kind of business here,” he said. In early May, Kingman’s Planning and Zoning Commission voted to allowed medical marijuana dispensaries in the city’s service business commercial zones and in light and heavy industry zones. Soon after, the City Council approved the commission’s recommendation. Reynolds said that even though the proposition prohibits dispensaries within 500 feet of sensitive locations like schools and churches, the commissioners wanted to make sure that they would be far away from children and community areas. 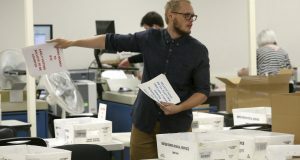 In the rural areas of Arizona, cities have gone through a similar thought process, said Andrew Myers, who acted as the campaign manager for Proposition 203. Cities start with hating the idea of a dispensary, he said, then realize that the alternative would be marijuana growing in homes and finally decide that having a dispensary is the best option. It is a conclusion that the Western Arizona Law Enforcement Association has been encouraging through its members in cities across Mohave, La Paz and Yuma counties, said Robert DeVries, the association’s chairman and Kingman’s police chief. DeVries said the association has been working to address common questions and problems medical marijuana could bring up for police. “Everybody was in agreement that having a dispensary in the community is better for the community,” DeVries said. In fact, Dwayne “Rusty” Cooper, captain of the patrol division for the Kingman Police Department, said it would be nice to have the dispensary right next door to the station. Myers said that rural communities have been much better about creating more reasonable zoning rules. Some have even placed them near police stations or in busy commercial areas. Cities that enacted the strictest zoning rules did so early and probably out of fear of the unknown, Myers said. Over time, as cities become familiar with the people running dispensaries, it’s possible that dispensaries will be able to move. Until then, he said, cities run the risk of creating a self-fulfilling prophecy. The business potential of a dispensary was attractive in Globe, the Gila County seat about 80 miles east of Phoenix. It’s allowing a dispensary in the middle of downtown. “We just wanted to stimulate the economy locally,” said Chris Collopy, Globe’s director of planning and zoning. Collopy said the city approved zoning measures for dispensaries even before Proposition 203 passed. Officials requested proposals from potential medical marijuana dispensary contractors that outlined all of the details for operating a dispensary, and Globe even offered up city property in the historic downtown district to house the facility. By January, the city had six proposals to choose from, Mayor Fernando Shipley said. Shipley said he and other city officials knew early on that Arizona would have a limited number of dispensaries and that patients would be able to grow marijuana if a dispensary was too far away. Their intent, he said, was to make sure the city was at the front of the line for a dispensary. “If at all possible we wanted to be one of the areas that had a distribution center,” he said. To Shipley’s surprise, the aggressive strategy didn’t draw any ire from residents. He said he was even more astounded when four of the proposals were from locals, well-known and respected members of the community. Though the proposal the city ultimately accepted wasn’t from a Globe resident, it goes far beyond the city’s requirements to have a strong focus on community development, Shipley said. The dispensary is in a different location from the building the city had offered for use, but it will still be about 30 yards from both the police and fire stations. Globe Farmacy, pending approval from the state Department of Health Services, will be located in a historic building downtown, according to the proposal submitted to the city. The dispensary is expected to initially create 25 jobs, most of which will go to Globe residents. As a nonprofit, Globe Farmacy also proposes to use proceeds after expenses to establish a fund for community needs, like supporting local services and ensuring the dispensary doesn’t burden the community. While it wasn’t his intent, Shipley said he isn’t opposed to the idea that it could stimulate Globe’s economy through increased foot traffic from patients in the downtown area. “We would be happy to take their money if they want to hang out in town,” he said. If Globe’s leaders had decided to paint all the curbs blue, Shipley said he would have had 100 angry citizens on his hands. Through the entire public process of approving a medical marijuana dispensary and a marijuana growing facility in the middle of downtown, only one resident showed up to speak against the plan. “I think it is because we let them know what our main concern was, and our main concern was protecting the people of Globe,” Shipley said. The city did everything it could before the proposition went into effect, he said. In Payson, a Gila County community about 85 miles to the northeast of Phoenix, Ray Erbanson, community development director, said the city has already approved zoning rules, and, like Globe, also experienced little outcry or input from citizens. “They understood that what we were doing was reasonable and there was really nothing we could do beyond that,” he said. Payson will allow dispensaries in the general commercial district, highway commercial district and industrial districts. From here, Erbanson said, it is just a matter of addressing problems if they come up and adapting. “At this point we just don’t know what the impact is going to be, so I think everybody is just watching to see how it is going to turn out,” he said. Strobeck, with the League of Arizona Cities and Towns, said that cities just have to look to California and Colorado to get an idea of how dispensaries will affect them. “In general, the marijuana dispensaries there have blended in with the rest of the commerce in cities,” he said. Most cities have had similar experiences to those of Globe and Payson, Strobeck said, in that there has been little tension surrounding the creation of zoning rules for dispensaries. The King James Bible says in the book of Genesis that every seed bearing HERB is for “meat” which translates into “food”. It’s exxon , R.J. Reynolds etc,etc,etc that want it to be illegal. Read the book ” The Emperor Wears no Clothes ” by Jack Herer. It’s on line too. Check out chapter 4. It’s all about the conspiracy dating back to 1937. It is all about control . White doctors prescribe herion for pain like oxycodone but truthful I tried that way it was awful I ended up strung out on pills. I went to herb because it makes great tea after you decarb in oven then coconut oil and Hawaiian Punch I have my pain medicine which is safe non additive and makes God happy. I am part of Native American church cannibas has been a sacrament for pain for thousands of years people really have the wrong idea your local drug dealers they are called white doctors put them in jail and the first admendmant protects my religious freedom if you do not like it do not do it . Some local governments had already been investing in solar projects before federal stimulus grants were available, but now many more cities and counties are doing so. 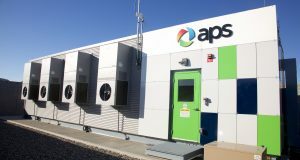 Experts say to expect more solar projects to pop up around Arizona and the rest of the country as local governments face a deadline of using stimulus money by the end of 2012.